Nana Akufo-Addo has been elected as the flagbearer of the NPP for the second time. 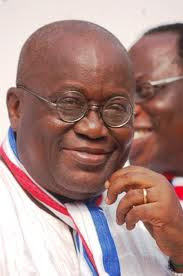 Even before the Electoral Commission (EC) declared Nana Addo Dankwa Akufo-Addo as winner of the New Patriotic Party (NPP) flag bearer contest, all the aspirants conceded defeat and pledged their unflinching support for the new flagbearer to ensure a resounding victory for the NPP in December 2010. The Efua Sutherland Children’s was bustling with activities when three of the four losing aspirants namely, Professor Kwabena Frimpong-Boateng, Isaac Osei and Alan Kwadwo Kyerematen made the solemn pledge amid jubilation by party supporters who had thronged the venue to witness the declaration which many political scientists have hailed as the best thing ever to have happened to Ghana’s democratic process. John Kwame Koduah, a Kumasi based lawyer and Evangelist a fifth contestant was not at the grounds but was said to have sent his congratulatory message to Nana Akufo-Addo according to the National Youth Organizer, Anthony Karboo. Among the high profile personalities of the NPP family that came around to witness the momentous occasion were former President John Agyekum Kufuor and his Vice Alhaji Aliu Mahama. Prof. Frimpong-Boateng who was the first to declare his support for Nana Akufo-Addo looked shell shocked at the trend of voting and his demeanor showed clearly he had been overtaken by events. With a quavering voice, he said “I am not ashamed to lose to Nana. I congratulate him for the resounding victory,” adding “I will be available for him during the 2012 election”. Prof Frimpong-Boateng had earlier expressed shock about his performance, querying where the figures were coming. “The figures are strange”, he had told Joy FM.